The title says it all. 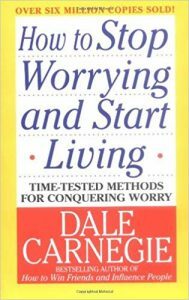 Dale Carnegie teaches How to Stop Worrying and Start Living. Ask yourself what’s the worst that can happen and be OK with it. The message from Dale Carnegie is that worrying too much will make your life shorter and more miserable. Thankfully, there are ways to deal and eliminate worries. Many people have done it, and you can as well. So make your life more compartmentalized and deal with each single compartment one by one. The next thing you should know about worry is that it asks you a very heavy price in terms of health. Albeit Carnegie doesn’t go as deep, what he’s basically advocating is a technique Tony Robbins teaches to changing neuro association. The idea is basically to associate lots of pain to your current behavior that changing becomes a must. Ask youreslf what’s the worst that can possibly happen if you cannot solve the problem that makes you so worried. First of all, get all the facts. Once you have all the information you need, make a decision. Once you have a decision, it’s time to act on it. No worries, no sweating, just action (read The Obstacle Is The Way for that mindset). What are all the possible solutions? Dale Carnegie suggests that believing in a greater being, in God, and praying, is a great antidote for worry. Churchill took two naps a day during WWII. Make sure you get enough rest as well. At work, clear your desk of all papers: mess around you translates into mental mess and stress. Then prioritize and execute (a mantra of Extreme Ownership). All the tips make sense, but they’re also common sense. What would have been more useful are all the nitty gritty of how to actually do it. I believe guys like Tony Robbins do a better job at that. Too Busy To Worry… Really? The suggestion to get too busy to worry is not only stupid but counterproductive. It doesn’t address the root cause. It’s like telling the hangover patient to keep drinking and the headache will go away. Better drinking water instead. The hang over will take more time to heal but it addresses the root causes. How to stop worrying and start living is one of the grandfathers of the self help books, together with Carnegie’s other timeless How to Win Friends & Influence People. The content is great and most of it is evergreen -as Ray Dalio said, great is better than new-. However, don’t miss out on new contemporary authors because neuroscience developed a lot since Carnegie and can teach us a lot.